Where the follicles are in contact with the overlying epithelium, the cortex is only present at the anti-epithelial side of the follicle. The surface epithelium overlying these follicles, the follicular associated epithelium, is a low columnar epithelium that forms epithelial tufts of palely staining pyramidal cells. 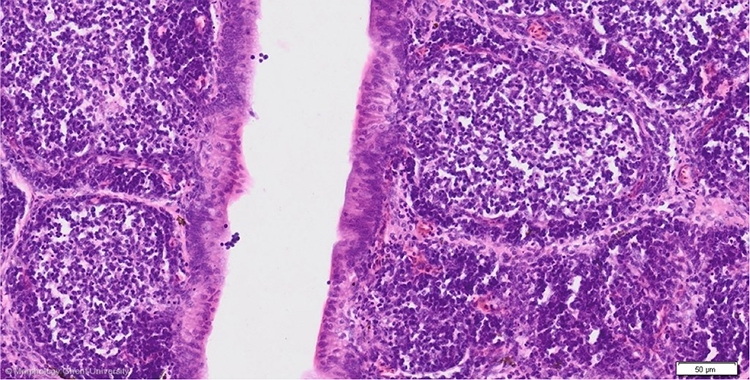 The interfollicular surface epithelium is a darker staining pseudotratified columnar epithelium.